#FIRST2EXPO- WITH THE BIGGEST MEDIA CREW ON GROUND, CARDEKHO BRINGS TO YOU THE MOST EXTENSIVE COVERAGE OF AUTO EXPO 2016. Mahindra has now rolled up its sleeves making various new launches in the country to strengthen its position in the Indian car market. 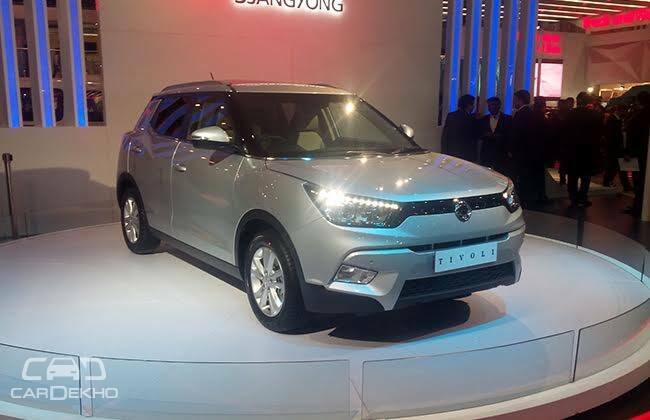 In the same spirit, the proud owner of SsangYong brand from Korea, has showcased its new vehicle Tivoli, at the Auto Expo 2016, currently ongoing in Noida. The design of the SUV has been inspired from the SsangYong XIV-Air Adventure concept and 70 percent of its body structure is made of high strength steel. The vehicle is all set to be assembled locally at the company’s plant located at Chakan, near Pune. New SsangYong Tivoli in its segment will compete against the likes of Hyundai Creta and Renault Duster, as both these cars have been immensely successful, especially amongst the youth of the country. 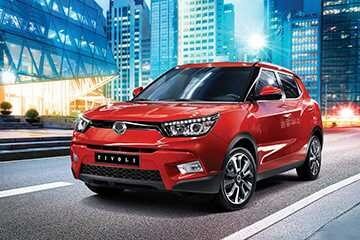 Outside, the compact SUV Tivoli features eye catchy robust design, mainly aimed to attract youth all across the globe. Manufacturers have chosen a new design language for the vehicle and that is the ‘Nature Born-3 Motion’. The car further receives slim-line radiator grille and flanked upswept headlights, LED DRLs. At the rear, the car flaunts taillamp with inverted L motif. New Tivoli rides on 16-inch alloy wheels, making it an amazing product on the whole. Moving to its interiors, internationally, SsangYong Tivoli gets three tone cabin - beige, black and red, however, Indian bound model is likely to get only beige or all black color schemes. The car is spacious and loaded with many advanced features such as 7-inch infotainment system, reverse camera along with MP3 player, APE, WMA and FLAC connectivity. For safety, it is equipped with 7 airbags, rear parking sensors, smart key entry and much more. Under the bonnet, India bound Tivoli will most likely get the 1.6 litre diesel engine, which is working in UK spec model. The powertrain produces 115PS and 300Nm peak torque, while on the other hand, the petrol engine would be 1.6 litre mill that generates 128PS and 160Nm max torque. The transmission duties will be handled by 6-speed manual or automatic, depending on the trim.